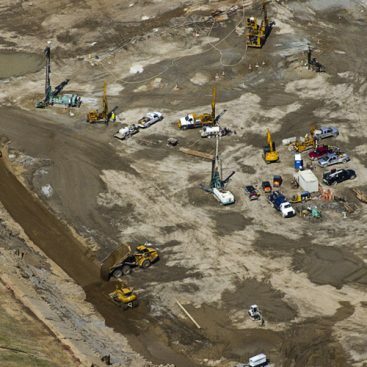 This project consisted of the installation of a Slag-Cement-Bentonite (SCB) Slurry Wall at a Non- Hazardous Industrial Waste (NHIW) Landfill owned and operated by a utility company. 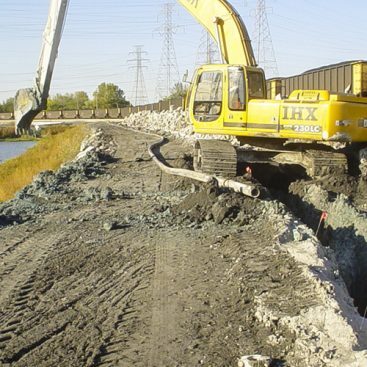 The cutoff wall was installed as part of a remedial measure to contain seepage observed emanating along the containment dike that runs along the adjacent river and into a lake. The slurry wall was keyed into the underlying bedrock. Beneath a portion of the slurry wall, the prime contractor installed a rock grout curtain to supplement the slurry wall in a highly fractured section of the bedrock and as part of the overall design. Geo-Solutions, Inc. was contracted to install the Slag-Cement-Bentonite (SCB) Slurry Wall. Prior to the field work, Geo- Solutions worked with the design engineer and the prime contractor the year before to develop an approach and work plan to achieve the client’s goals. For the construction effort, Geo-Solutions provided all personal, equipment, material, and services necessary for the SCB slurry wall construction. 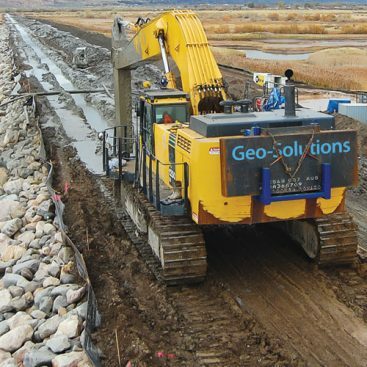 Geo-Solutions, Inc. furnished a skilled slurry trench specialist, necessary operators and laborers for the slurry wall, and quality control per industry standards. 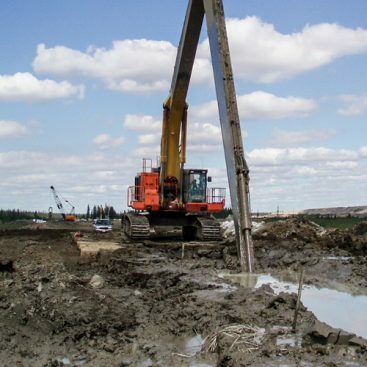 Equipment that was used for the project included a 40 Metric Ton Excavator capable of reaching the proposed maximum depths, a Geo-Solutions manufactured, high volume, cement-bentonite mix plant and other support equipment. Materials provided for the project include all slag, cement and bentonite materials. Quality Control tests performed on the project showed the SCB slurry wall to meet the requirements of a 28-day strength (unconfined compressive strength) in the 100 to 150 psi range and a permeability in the 5 x 10-7 cm/sec range. The owner was pleased with the efforts of the construction team and the project was completed safely, on time and within the overall budget. A total of $27,000 of owner-initiated change orders was included in the overall cost of the project.